They shared a passion for Alaska. They were business partners. They consulted one another almost every day, usually at the office, and met contractors hired for big jobs when big jobs were necessary. He enjoyed the work - daily journalism - and she saw him as a “life partner” in an endeavor that would stretch deep into the future. She didn’t mean “life partner” romantically. She suggested that working hand-in-glove, the two would become storytellers to the Last Frontier and reap the rewards of her money and his sweat equity. She was Alice Rogoff, who became owner of the Alaska Dispatch and the Anchorage Daily News. He was Tony Hopfinger, who, with various titles, was in charge of news content for both organizations under Rogoff. And in November, they sat with their lawyers at separate tables in a fifth-floor Anchorage courtroom. On his table, a generic nameplate said “Plaintiff.” This was the so-called “cocktail napkin lawsuit.” Hopfinger was suing Rogoff for close to a million dollars. The cocktail napkin was, Hopfinger argued, an unconventional yet binding promissory note for his share of the business - a buyout. A 12-member jury would decide if he got anything for his stake in their endeavor. A cocktail napkin contract sounds like an agreement concocted by two hustlers in a Vegas back room. But Rogoff signed this napkin, testimony demonstrated, in the offices of her attorneys, Birch Horton, one of whom may or may not have watched the napkin transformed into a binding document with a few pen strokes. There was a dispute over who else was present with Rogoff and Hopfinger on April 12, 2014. If a promissory napkin is unusual, both the Alaska Dispatch and the Anchorage Daily News were unusual businesses once Rogoff bought 90 percent of the Dispatch and 100 percent of the News. Oh yes, the media companies had the appearance of regular businesses. There were endless formal statements, many signed agreements, corporate emails between employees by the thousands.The companies had bookkeepers, lawyers, advertising sales staff, techies. Reporters wrote stories that reached an audience that extended far beyond Alaska. Nevertheless, the actual operation of the businesses would be unfamiliar to anyone who came of age in a traditional company. There was no budget, there was no long-range plan, there was no management structure. There was no careful internal review of major decisions, including the decision to buy the Anchorage Daily News. There were no experts called in to evaluate operations and make recommendations to improve them. As Hopfinger said more than once at the trial, he came to work every day and threw stuff at the wall, watching to see what stuck. Putting the metaphor aside, this was a labor of love conducted by improvisation. Listening to Rogoff and Hopfinger explain their approach to journalism, the words of a famed American improviser-entrepreneur who made a fortune came to mind. As Elvis Presley sang, “You gotta follow that dream wherever that dream may lead you ... Gotta follow that dream.” The dream led Rogoff to spend millions of dollars on the Dispatch and the News, millions that never produced a profit and became a permanent fixture in the loss column. Rogoff optimistically cast her expenditures as loans to her companies. There would be a payday - except the payday kept receding further and further into the future until it disappeared into the fog of failure. 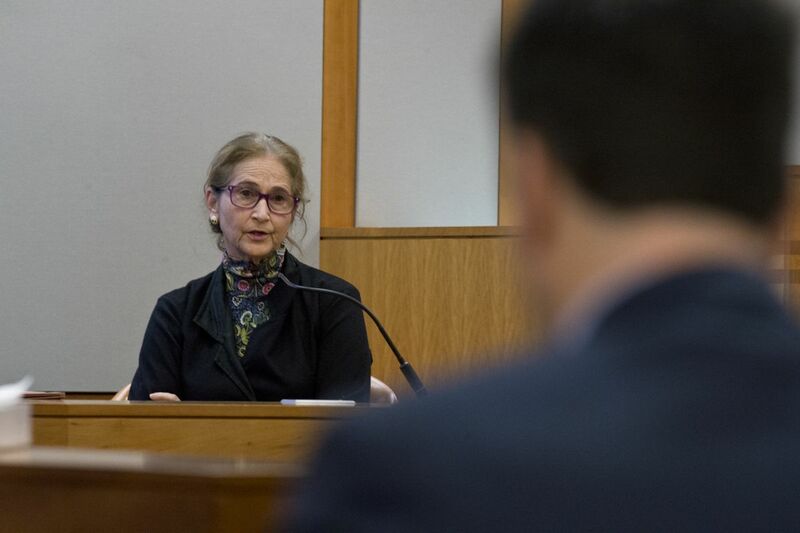 During the trial, Rogoff's lawyer David Gross gently guided Rogoff through her biography. The biography Alice Rogoff recited was all a success story, the kind of summary you find in “Who’s Who.” But a “Who’s Who” entry is not a person. The best you could say for the woman on the witness stand was that although she was losing money, it was her own money. Rogoff may have been a good staffer in Washington, D.C., but in Alaska, she had to become a leader, a decision-maker, and could not make the transition. Her testimony, which was extensive, made her seem badly informed, without curiosity and afraid to challenge people in crucial situations, even with her money on the table. Hopfinger, 44, was not a flawless plaintiff. After all, Rogoff had not made this mess on her own. He helped create enough red ink to paint the courthouse scarlet. But he was a conventional witness who could answer questions methodically. Plus, he never looked like the sleazy adventurer after the little lady’s money that Mr. Gross made him out to be in cross examination. Mr. Gross is a solid lawyer - he did the best he could with a difficult case. When the jurors returned from their deliberations, Tony Hopfinger didn’t get everything he asked for. The jurors said no to several of his claims. But he did get $852,000, a handsome payday beyond the reach of all but a few Alaskans. No wonder Robinson rubbed his back as they sat at the plaintiff’s table while the good news filled the courtroom. Rogoff was not present for the verdict. Alice Rogoff’s story is unique. But Alaskans have seen variations of this story before. Someone from Outside shows up on our doorstep expressing their love for Alaska. They’ve got money and ideas. They are going to make something big happen - and we want something big to happen, something that will produce excitement, opportunity, and ah yes, dollars circulating throughout the community. But the story doesn't end with a gala in a Captain Cook ballroom. The newcomer goes broke, creditors pounding on the cabin door. We feel deceived. The newcomer put something over on us. But let's take another look at the story. Maybe we believed the big tale the newcomer told us more than our own eyes. Maybe we put something over on ourselves. Michael Carey is an Anchorage Daily News columnist. He can be reached at mcarey@adn.com. Michael Carey is an occasional columnist and the former editorial page editor of the Anchorage Daily News.